You can find more articles on this subject in our Excel VBA blog. However, the best way of learning is to attend our two-day Excel Visual Basic course, or the two-day advanced VBA course. Create a reference to the Microsoft Scripting Runtime object library. Create a new FileSystemObject variable. Here's how to do this! 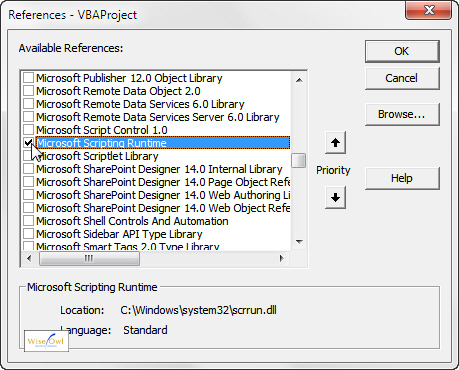 Within VBA, select Tools References from the menu as shown above. 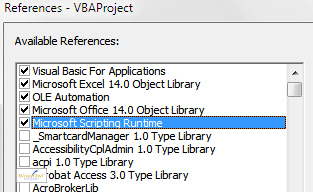 Tick the Microsoft Scripting Runtime library as shown below, and click OK. The object libraries that you are referencing appear near the top of the list. Now that you've referenced this library, it's time to create a FileSystemObject. The easiest way to do this is to create and instantiate a public variable to refer to a FileSystemObject in a single line. If that sentence didn't make much sense to you, don't worry! In practice all that you need to do is to type in a single line of code, and everything else will fall into place! The only reason FileSystemObject appears in the list is because you have referenced the object library containing it. Running the ListFiles routine shown above would create a listing of all the files in the wise owl folder of your C drive in the immediate window.